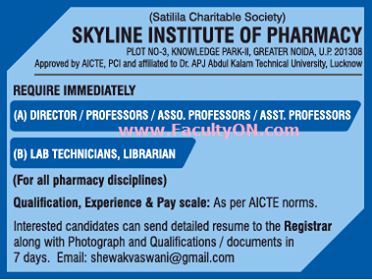 Skyline Institute of Pharmacy, Greater Noida has advertised in Times of India newspaper for the recruitment of Associate Professor/Assistant Professor/Professor jobs vacancies. Interested and eligible job aspirants are requested to apply within 7 days. Check out further more details below. About College: Satilila Charitable Society was founded in 2001 under the Society Act 1860, by a renowned industrialist and philanthropist, Shri. S. L. Vaswani. Under his visionary leadership, the society has today evolved as a premier group of institutions i.e. Skyline Institute of Engineering and Technology and Skyline Institute of Management and Technology.